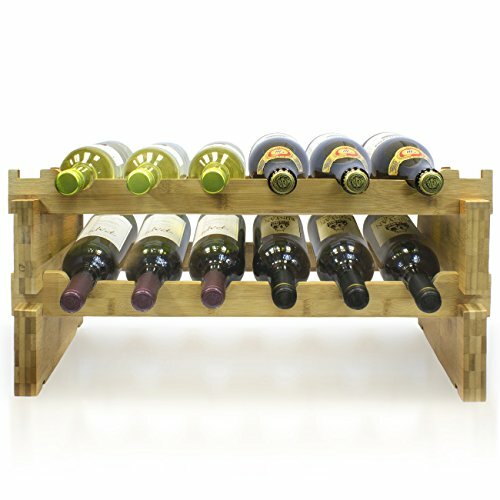 Make a toast to showcasing up to 12 wine bottles with the Sorbus® Bamboo Wine Rack! Created with timeless and breathtaking bamboo, this stackable 2- tier shelf is perfect for both new wine collectors and expert connoisseurs. It's functional , coordinates well with existing décor, and ideal for any flat surface area in the pantry, wine bottle storage cabinet, kitchen, dining room, basement, wine cellar, or bar. Its versatility allows you to customize your space by stacking vertically, side by side, or separately. With a beautiful scallop shaped design, each wine bottle is stored horizontally to ensure both the wine and the air bubbles are in contact with the cork and stay in place without wobbling or tilting. Perfect for entertaining, this wooden wine rack can transform any space into a home bar. The 2-tier rack is constructed from high quality bamboo wood with scallop/wave shaped shelves and a smooth finish. Minimal assembly, no tools required. Holds most standard wine bottles and up to 6 bottles on each tier (12 bottles total). Measures approximately 23.50" L x 11.25" W x 11.50" H.